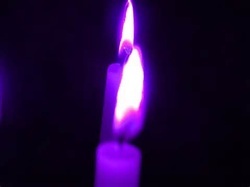 The Violet Flame is a gift for all people to use. It is a Holy energy that transmutes negative energies to positive. It can be used to heal oneself and the Earth, transform negative karma, and help forgive people and events. The Violet Flame, also sometimes called the seventh ray is linked to St. Germain and ties into the crown chakra. This flame is a tool to help raise your personal vibration, increase awareness and accelerate spiritual growth.